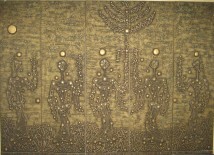 Castel Moshe (1909-1991 b. Israel) at age 12 studied at Bezalel Academy of Arts and Design, Jerusalem. Studied at Academie Julien, Paris, France and Ecole du Musee du Louvre, Paris, France. He was one of the founders of the “New Horizons” Group. In 2010 the Museum of Moshe Castel was built in his honor/memory in Maalaeh Adumim, Israel.